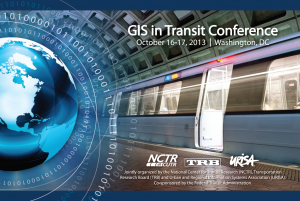 The conference planning committee is pleased to announce the final program for the 2013 Transit in GIS conference. The program contains over 50 presentations to help for participants identify sessions of greatest interest. I really enjoyed to have participated in this conference. I just wanted to ask if anybody else noticed that the so-called first use of GIS in history was actually depicted at the center wall of the National Academies entrance foyer. The center wall is dedicated to biology and medicine. It was a reproduction of the map of London in which John Snow, in 1854, marked each occurrence of cholera to discover that it was being spread by the Broad Street pump. I thought it was interesting to share with you. Hope everybody had fun and learned something new.